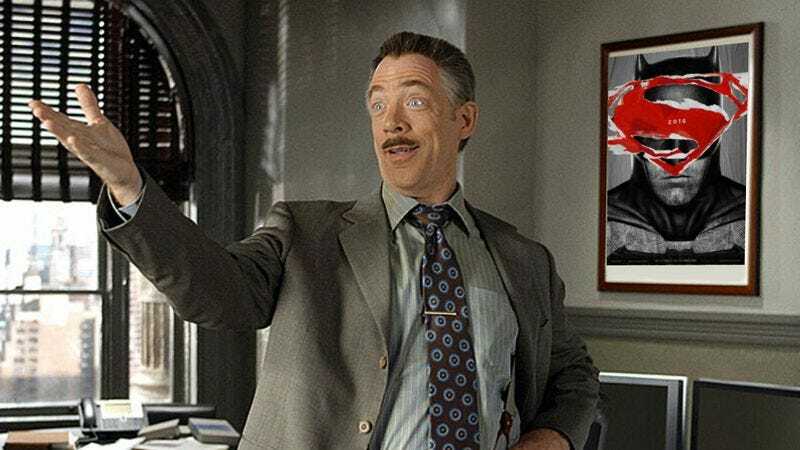 According to The Hollywood Reporter, J.K. Simmons is going to be putting on some facial hair again to play another mustachioed comic book character. He previously played the eternally angry J. Jonah Jameson in Sam Raimi’s Spider-Man movies, and now he has moved over to DC and Warner Bros. to play Commissioner Jim Gordon in Zack Snyder’s Justice League: Part One (and probably Part Two as well). We don’t know anything about Justice League’s plot, other than that it will be about “the mythology of Doomsday” for some reason, so it’s unclear how a regular guy like Gordon will play into what will surely be a superhero smash-fest. He’s just as important to Batman’s world as anyone else is, though, so this could be DC and Warner Bros. simply setting up the various threads of the cinematic universe they’re building. After all, if Ben Affleck is going to star in a solo Batman movie at some point, they’ll need someone to play Gordon. Introducing him in Justice League—and getting a respected actor like Simmons to play him—sets the stage for that pretty cleanly. As announced back in January, Justice League: Part One will open on November 17, 2017, and Part Two will arrive on June 14, 2019. Both parts will star Ben Affleck, Gal Gadot, Henry Cavill, Jason Momoa, Ezra Miller, and Ray Fisher as the members of the eponymous super-team.